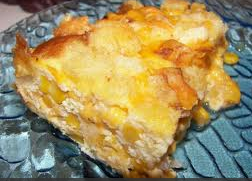 Swiss Corn Casserole | STIR UP THE KITCHEN!!! Cook corn per directions, drain, add to milk and egg. In 1 tablespoon butter, saute onion until soft. Add to corn mixture. Add salt, pepper, 3/4 of cheese; stir to mix. Pour into greased 1-2 quart baking dish. Toss bread crumbs with remaining butter and cheese. Sprinkle over top. Bake at 350 degrees for 25-30 minutes. Serves 4 to 6. This entry was posted in Vegtables. Bookmark the permalink.